When I first heard that Ruth was writing a book about helping kids with traumatic backgrounds through writing, I was thrilled. As many of my readers know, my husband and I opened our home and hearts to two young girls who have hard backgrounds. Before the girls came into our lives, I thought that young children from similar backgrounds just needed someone to love them and everything would be fine. As Ruth explains in the first part of her book, children’s brains are altered when they experience traumatic events in their lives. 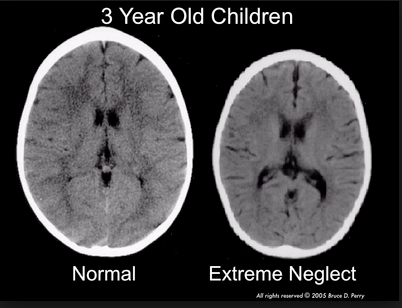 Below is an image of two brains, one from a 3 year-old who received love and nourishment from the beginning of her life and one who has experienced extreme neglect. The amygdala, which controls our emotions is enlarged in the child who has been neglected and traumatized. The amygdala is where fear comes from and children who have trauma in their backgrounds live with fear every day of their lives, even when we perceive there is nothing to be afraid of. As I read the book, I couldn’t help but think that all teachers, not just teachers of writing, should read this book. We all have hurting children in our classrooms, children who are hungry, fearful, and anxious. 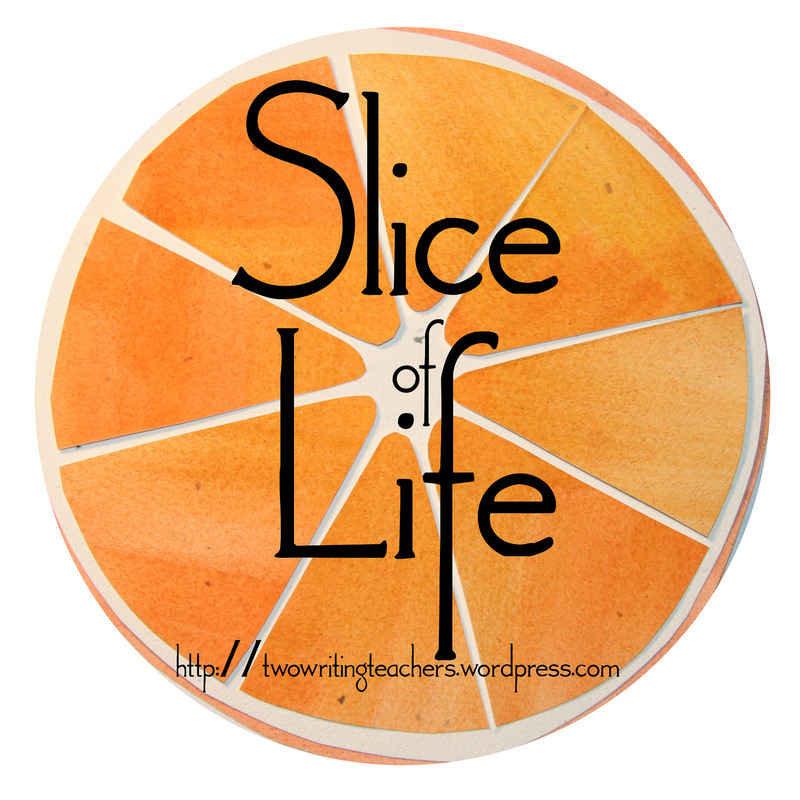 I’d like to highlight some of the stories and quotes that spoke to me as both a teacher and a foster mom. Ruth helps us understand how children from hard backgrounds are impacted. She helps us know that children who appear to be willful and disobedient are likely reacting in fear. We’ve all had those students who tell us that they don’t know what to write about or don’t have a pencil to write with and little writing gets done. Like Ruth, I used to have kids leave a shoe by my desk if they needed to borrow a pencil. I wish I'd known then what I know now. Children come to us giving us the best they can give with the resources they've got. It's up to us to meet them where they are, because they may be doing their best to just keep safe. We need to remember that "they aren't trying to cause problems; they are doing their best" (p. 21). In the second section of the book, Ruth cheers us on to be writers ourselves and reminds us of the importance of writing workshop. On p. 61, she says, "...writing workshop is essential to education. Not because every child should grow up to be a writer, but because we all must learn to communicate our stories, our beliefs, our knowledge in order to make the world a better place." I believe with all my heart that we need to provide spaces for our children to tell their stories, especially the hard stories. Sometimes it is only through writing that the stories can be told because they are too hard to say out loud. Our children need to feel empowered knowing that their voices matter. 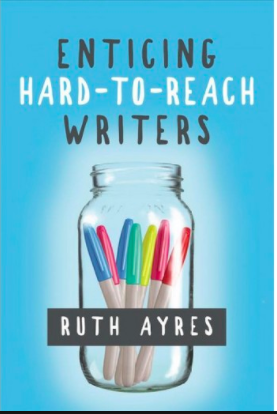 Part 3, Moves to Entice Students to Write, is chock-full of ideas to help even our most reluctant writers put pencil to paper (or fingers to keyboard). I love her "celebration mindset." 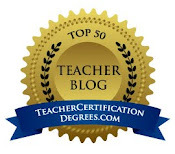 I recently shared a video clip with teachers in my building by Matt Glover. In it, he was talking to parents about the subtle difference between nudging our young writers and pushing them. He tells the story of his son going out on the dance floor and his wife teaching him to dance, one step at at time. She acknowledged where he was as a dancer and she gently nudged him one dance move at a time, instead of pushing him by giving him all 15 steps at once. Ruth's philosophy is the same. She reminds us, "Instead of focusing on the things students don't do well, consider the things they are almost doing as writers" (p. 82). Oh, this is so true. We all know what it's like to sit down with young writers. There are a million things we could talk about with them. But, we need to remember that our writers are children and they are going to write like children. Their writing won't be perfect. If we help them pick out the gems, the things they are doing well and find one thing that they are almost doing, we can give them specific feedback that gives them that little nudge to move forward. I hope this brief introduction to Ruth's book "entices" you to go out and get it. I've only touched on a small part of all the things I loved about this book. My copy is dog-eared, underlined, highlighted and filled with notes. I know that I will go back to it over and over again. This is a book with heart. It's so much more than a "how to teach" book. The stories woven throughout are poignant and important. Many of the stories made me chuckle, while others brought tears to my eyes. I could relate. We need to erase the stigma that comes with these mental health issues and move toward helping others understand what early trauma does to a child. Thank you Ruth for this beautiful book. In case you missed other stops on the blog tour, you can check them out below. Thank you to Stenhouse who is giving away 2 free copies of Ruth's book. Please leave a comment about this post by November 30, 2017 by 11:59 EST to enter. Winners will be chosen by a random number generator. Ruth is also offering free registration to her new course Enticing Writers Book Club if you purchase a copy by November 30th. Just forward your receipt to enticingwriters@gmail.com for a free registration. The course begins in January. This is great, great advice: "Instead of focusing on the things students don't do well, consider the things they are almost doing as writers." It's so easy to see what's wrong and it takes training to be able to see the strengths first, but it's absolutely essential. Looking forward to reading this book! Thank you for sharing your personal connections and reminding everyone that we all teach writers. The best teachers are those that write. Great message. You are such an inspiration Julie! Those images of the brain really drive home the point about trauma in a way that reading about it just doesn't do. Thank you for sharing your insights on this book, Julie! It's so hard to remember to just "nudge" students along. Some of my gifted students can be the most reluctant writers. Some because they are overwhelmed with all the ways they can "get it wrong" and their perfectionism gets in the way. Other times they just have so much going on in their heads that there's no way they can capture it all on paper. Reminding them to just take one little step is important. Thanks for sharing! I love your blog post! This is exactly what we have been talking about in our staff meetings. I would love to read the book, I am always trying to connect with students. Knowledge is power! Thanks for sharing! I agree it’s a book for all teachers. And it has a special meaning for teachers/ adoptive/foster parents- I have shared it with two teachers I know who are moms with adopted children. Thank you for sharing your perspective. It is so helpful to hear your thoughts as an educator and as a foster mom. Welcome back <3 Love you, your story, your blog, your review. Purchased two copies! What a beautiful post and so happy to read how it tugged at your heart! Welcome back to blogging, I can't wait to read the next piece. I do believe this book is not only for all teachers, but for anyone who cares about children or who works with children in another capacity. There are many ways to apply Ruth's knowledge and suggestions to other disciplines. I'm glad you're back to writing, Julie and enjoyed your sharing in this post. This is so important. As you beautifully point out, this is a message for all teachers. Just ordered my copy. You were selected to win a free copy of Ruth's book. Email me at juliaajohnson62@gmail.com with your address so we can send your book to you. Congratulations! Congrats on your return to blogging! Thank you for your insight and your breakdown of the book. I enjoyed reading it. Your quote choice was perfect: On p. 61, she [Ruth] says, "...writing workshop is essential to education. Not because every child should grow up to be a writer, but because we all must learn to communicate our stories, our beliefs, our knowledge in order to make the world a better place." Amen! Let's make writing meaningful! I bought a copy at NCTE and have been reading it bit by bit. I am so fascinated by the brain research. I knew that autistic kids have different brains, but I did not know this about trauma. There are so many ways I connect to Ruth's message. She writes with conviction and hope. She knows it's hard, but she lets us know it's possible. All my best to you with your girls. Love this post and these words: "...we all must learn to communicate our stories, our beliefs, our knowledge in order to make the world a better place." I love Linda's comment that this is a book for anyone who cares about children. Have you read the book Forever, Or a Long, Long Time? An incredible story about foster children. And for those of us who know Ruth, we understand why this is a book with heart. Thanks for this post, Julie! Wonderful post. This is so true: "Instead of focusing on the things students don't do well, consider the things they are almost doing as writers" I have followed "brain research" through the years. I'm sure that is why I have always supported recognizing what students have learned, not what they have not learned, asking students to highlight their best or most improved, and never putting a minus but always a plus if scoring. Thank you, Ruth, for your wise words. These points you've pulled out are so important--I think I need to read them every single day. Kids (and teachers) need to feel safe, to feel their writing is valued, and to celebrate writing. I'm so looking forward to reading this book. The first part of Ruth's book changed my perspective with children. Your quotes and highlights are what teachers need to hear. Thank you for sharing. Wow! This brought me to tears! I must get this book!! It was so good to meet you at NCTE, I'm just sorry I never ran into you beyond that first day. You have highlighted many of the parts I loved when reading this book. Now I will go back and read it again to see what I missed the first time. Hi, I’m also assignment writers, I read the book, I couldn’t help but reason that all teachers, not fair teachers of writing, necessity read this book. We all have sad kids in our classrooms, youngsters who are ravenous, terrible, and anxious. I’d like to highpoint some of the levels and quotes that spoke to me as together a teacher and a foster mom.